The month of April included Library Week at Abu Dhabi Men's College, from 20 - 24 April. It would have been hard to miss that it was Library Week with all the decorations, signs, events and changes to the furniture arrangement! 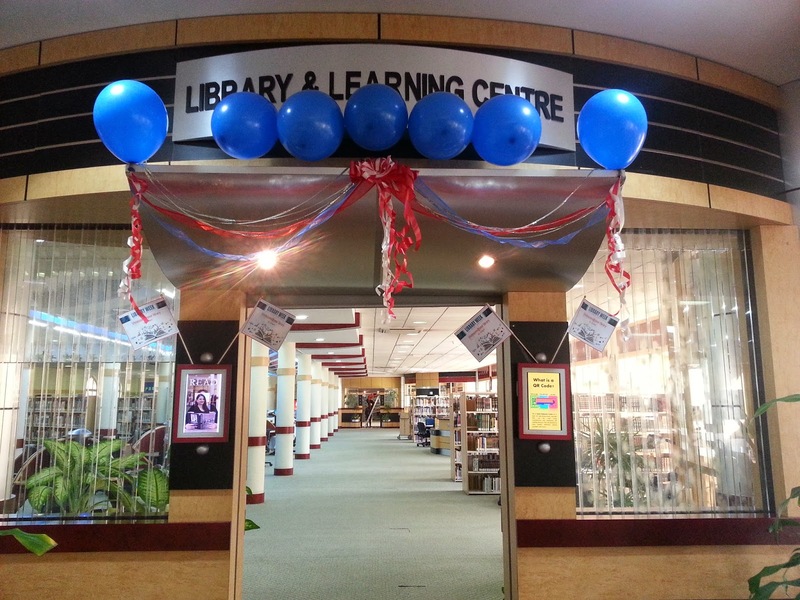 The theme for ADMC's 2014 Library Week was "life lessons @ your library". So in keeping with the theme, we offered events and displays that sought to influence and educate our users beyond the usual stereotypical roles placed on libraries. A class being taught in the "Majilis Makerspace"
We had our "Majilis Makerspace", an area in the Library that touched on both the culture of the UAE, as well as providing a unique learning environment were students could learn in a practical way. In our "Majilis Makerspace" we offered a 3Doodler presentation where Applied Media students could experiment with this exciting new design technology. We also had an exciting afternoon of CIS students learning with Lego, using mini robots to navigate mazes and bridges designed by the students. An unexpected but thrilling result of having a Majilis in the Library, was the number of teachers who decided to teach their classes in this space. 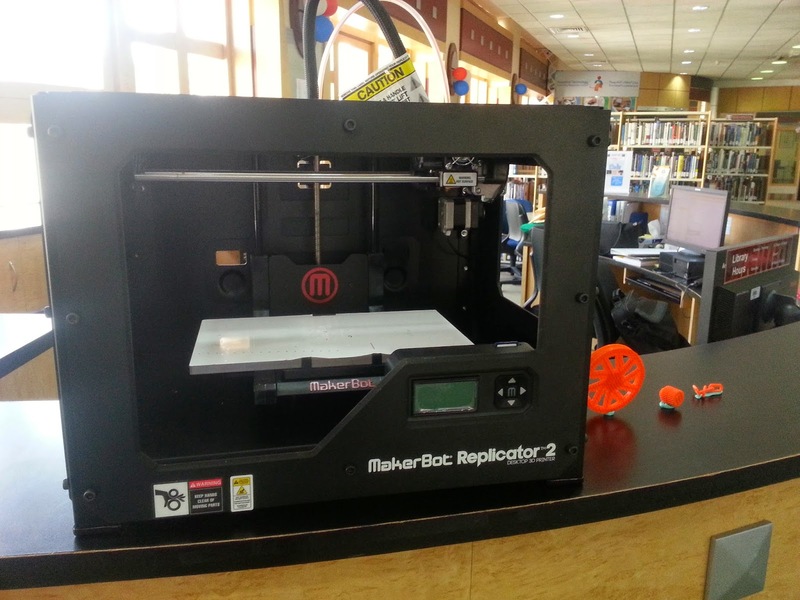 For the first three days of Library Week, we were very fortunate in having Precise ME in Dubai lend us a 3D printer! Several futurists have said that 3D printing will be the next disruptive technology that will change the way we live and work, and the way we shop and manufacture. Library users were able to get a glimpse of this future by seeing how this printer could create tangible three-dimensional items created from plans. We made some very useful objects, and a few fun ones as well. We were interested to hear what students and faculty thought about eBooks versus print books. During Library week we had a very enthusiastic student volunteer to help us survey all our visitors to the ADMC Library. We have gathered a lot of interesting data from your results which we will share in the next newsletter. Also during Library Week, we had a continuous display of extracts from H. E. Shaikh Mohammad bin Rashid al Maktoum, Vice President and Prime Minister of the UAE and Ruler of Dubai's latest book "Flashes of Thought". There are so many "life lessons" that anyone could benefit from by reading the ideas, memories and wisdom of this great leader. Finally, congratulations to Mohsen Ali Habib Abdulla Benam Alhammadi, who was the winner of ADMC Library's Lucky Draw for Library Week!